Yesterday's Champions' League tie between Manchester United and Real Madrid has shown clearly a true test of emotional display and strict business character on the side of Cristiano Ronaldo who was playing in his passionate Old Trafford stadium for the first time since he joined the Spanish giant on a mega splashed 80million pounds transfer in the 2009 season. The match that ended two goals to one in favor of the visitors saw the Portuguese ending the Red-Devil's Champions' League dream for the season with his 73rd goal at Old Trafford, 72 of which he had scored for United in the past. At the end, his business with Real Madrid overwhelmed his love and emotion for Manchester United. not in his best form during the game last night. It was observed that throughout the first forty five minutes, the former world footballer of the year did not have any shot on target, and his free space shot which has always been the fear of any goal-keeper was not seen throughout the match. Even when he scored the crucial goal that gave Madrid a lead in the second half, he bluntly refused to tamper with his emotion and that of the Manchester United's supporters, by jubilating. An attitude he first exhibited after his equalizing goal in the first leg of the tie in Bernabeu. This of course shows the psychological challenge that this world famous player might have faced playing against a team he has always re-affirmed his love and commitment for. Can anyone ever think of a player who has left a club, yet goes ahead to repeatedly express his love and respect for those he left? Who has done this more than Cristiano Ronaldo? Since his leaving Manchester United, this affection has kept enveloping him. The bond between the Portuguese and the Old Trafford club is so strong that he keeps re-integrating his desire to come back to the club. In many of his quotes, he has consistently emphasized on how happy he was in Manchester. His expression such as "no place like United" is not disputable. Here are some of his words in recent time: "It would not feel right to play for anybody else in England apart from Manchester United. They have been my home for so long, and it would feel like cheating if I played for anybody else"… "Every time I can, I try to watch United's games on television; I still like to know what's happening at Old Trafford. Despite being at Real Madrid, I'm always happy when I know United has won"… "Of course I miss Manchester, I miss especially the apple crumble and custard they served at Carrington after training… it was amazing". Before yesterday’s tie, he was quoted saying "Madrid and United are the two biggest clubs in the world and it's 50-50. It could go either ways. Manchester was my home and still in my heart. I love it, because when people treat you very well, you will never forget that. I will never forget United, the people who work there and the supporters. So I am so happy to be going home, back to Manchester". However despite his emotional attachment to his former team, Ronaldo was on a business assignment for Real Madrid last night against his loved team, Manchester United at Old Trafford, playing as a major opponent to the Red-Devils. What a dilemma! Even though it was difficult, he later sealed the match for Spanish team, three minutes after Lucas Modric had re-awoken the Blancos with his equalizer in the 66 minutes of the second half, leveling with United who had had a lead in the early minutes of the second half from a home goal which came from defender Sergio Ramos, with Ronaldo’s goal making it two goals to one. It was no doubt a heart break, not only to Manchester United fans, but also to Christiano Ronaldo who even though on the field playing against United, still saw many of the United's fans with his pictures and different captions, welcoming him back to Old Trafford. The Portuguese could be said to have engaged in a battle of business and emotion, of which the business part was more powerful than his emotion to the team of his heart Manchester United. His responsibility was first to Real Madrid… it was business; therefore, his business had to prevail over his emotion. 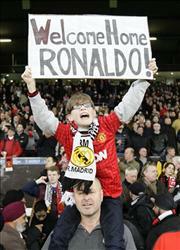 Ronaldo shows how humble and human he ıs,rıght there ın Manchester. It was a very emotional match. Yeah, what an emotional game that the CR7 who is very formidable against Barcelona FC couldnt even fire a shot @ Man Divived's goal post... Halla Madrid! World class Ronaldo showing great character. How Much More Defeat Will Barcelona Withstand? Why Should You Marry For Love?